NOTICE: In the event of a postal delivery interruption, we will hold all completed Records Checks for personal pick up at the Records front counter. This practice will continue for the duration of the interruption so applicants are not further inconvenienced. 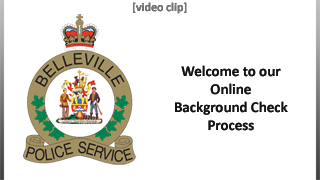 Welcome to the Belleville Police Service's new online process for persons needing a police screening check for volunteer or employment purposes. This system allows you to apply for a police screening check 24 hours a day without having to attend our facility. All aspects of the process - including verification of your identification, and fee payment - are handled electronically. If there are no concerns or follow-up required, your police screening documents will be mailed to you in a confidential envelope. Please note: You must be a resident of the City of Belleville (including areas of Corbyville, Foxboro, Plainfield, Roslin and Thurlow) that are in the Belleville Police Service’s jurisdiction) in order to apply through this Police Service. If you fail to authenticate your ID online, the system automatically generates a notice (and email), requesting you attend our station in person, with two pieces of ID, to be manually verified against your application. As long as you at least reach the authentication stage of your application on line, you will be processed at the on line pricing and not charged the $10 surcharge for applications processed start to finish at the front counter. Persons requiring records checks for the purposes of Adoption, Kinship Care or Non-Parental Custody (through court order) cannot use this online screening process. You must attend the front counter of the Belleville Police Service located at 93 Dundas Street East, Belleville, in person, to make application. A police record check is current as of the date it is completed. It is your employer/prospective employer or organization's function to determine if the record check is current enough to be accepted for the position applied for. The Belleville Police Services Board, its officers, agents and employees, shall have no responsibility or obligation to make such a determination. The Belleville Police Service will return the results of the check by mail to the applicant only. We will not mail the results to a third-party organization or employer under any circumstances. For volunteer or employment purposes, details convictions, outstanding charges, peace bonds, judicial/probation/prohibition orders, and relevant absolute/conditional discharges. there is a $10 surcharge for visiting the police station.